Ever since I moved out of home at the age of 22, I have meal planned. 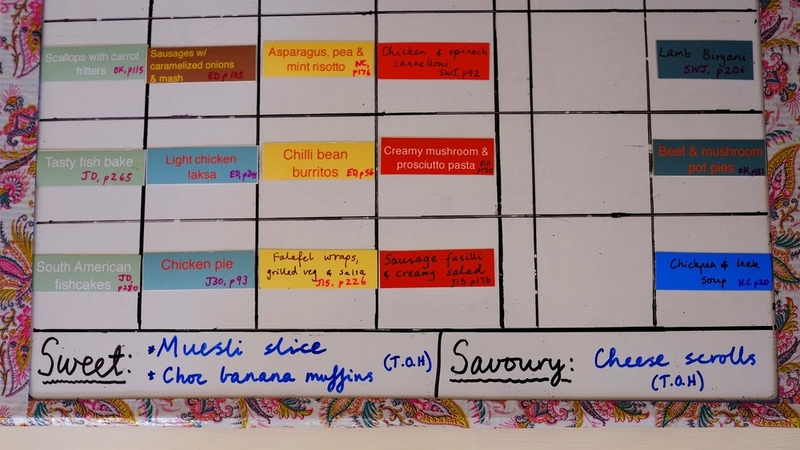 It started off as just a weekly meal plan that my flatmate and I came up with based on who was home each evening. We had a very limited number of recipes to draw upon (the days before technology and great sites like taste.com!). When I moved in with my now-husband, we only had 2 recipe books - Donna Hay and Bill Granger. My husband is an amazing cook, so he would often just make up dishes on the spot, but I like to religiously follow a recipe, so always needed to have that planned reference. The weekly meal planning method worked okay until the kids came along and time became even more precious. 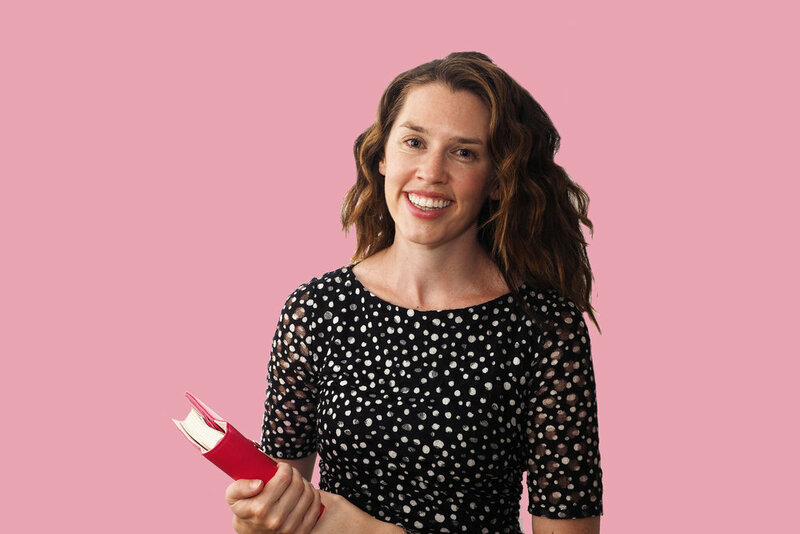 When Sunday rolled around and it was time to meal plan, I really disliked the process of having to think of a variety of healthy dinner recipes and trawling through the (now-expanded) collection of recipe books. It just seemed to take me so long! This method works for some people, but I wanted something quicker and easier. In setting up a new meal planning process, I did quite a bit of research on different blogs to try to find a method that resonated with me. 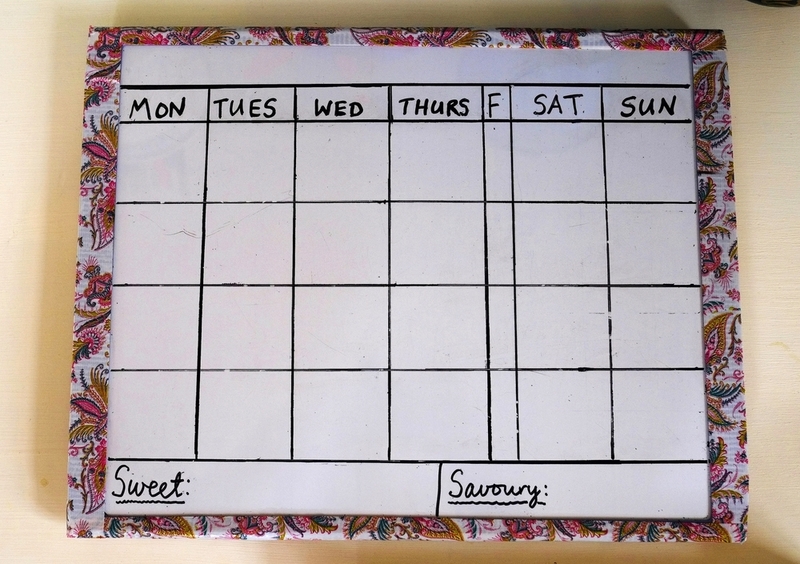 In the process, I came across a guide to monthly meal planning using magnetised paper - who knew such a thing even existed?! 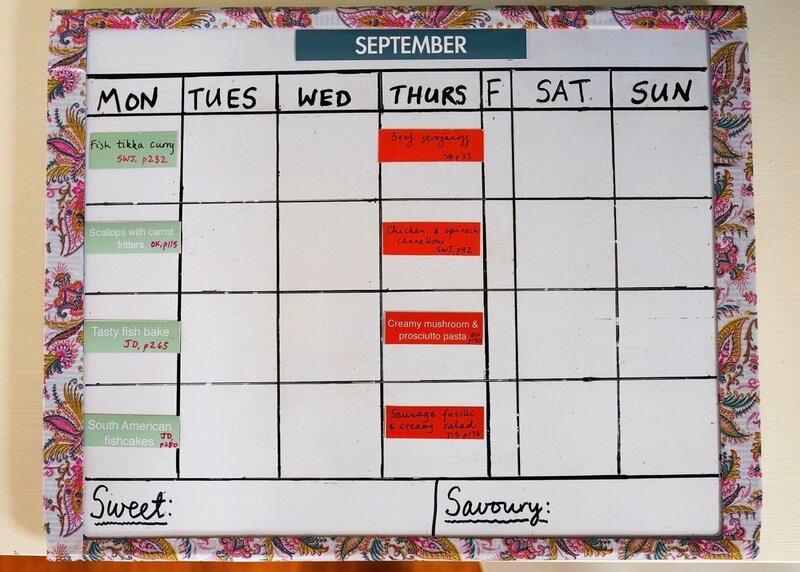 Megan of The Homes I Have Made used a whiteboard to place colour-coded 'meal magnets' (which she sells on Etsy), mapping out easy dinner recipes throughout the month. I decided to give this a go myself, and 18 months later I am still loving it! I started by purchasing a small whiteboard from an office supply store. It has magnets on the back so it can stick to the fridge, or you could also place it in inside a cupboard if you don't want it on display. I used some patterned scotch tape to pretty up the edges. Scotch tape is similar to washi tape, but is wider and stays put on plastic surfaces. 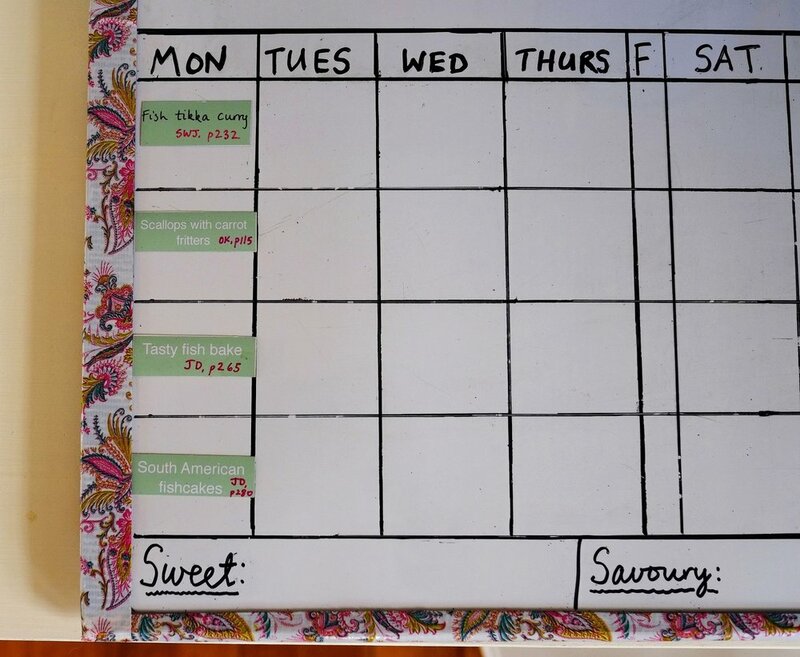 I divided the month up, but because 7 days didn't fit for the length of the magnets, I made Friday smaller as we rarely cook on this night - often take-away or something easy like toasted sandwiches. I also left space at the bottom for baking ideas. The part that definitely took the longest was going through all my recipe books and transferring the recipes I use onto the magnetised paper. I made up my own template based on the one I'd seen, using the colour-coded categories of fish, chicken, pasta, lamb, beef/pork, vegetarian, soup and favourite meals. 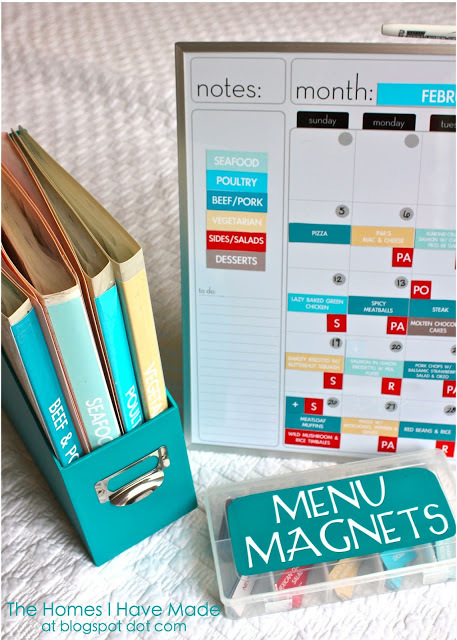 I started off typing onto the magnets, but as we got more recipe books, I ended up hand-writing them which was so much quicker! I also added the initials of the recipe book they were from and the page number (e.g. SWJ - 'Saving With Jamie'). I printed them onto the magnetic paper and cut them out. This part did take a long time but was so worth the effort! Here are all the recipes, housed in a container that I found in the sewing section at Spotlight. 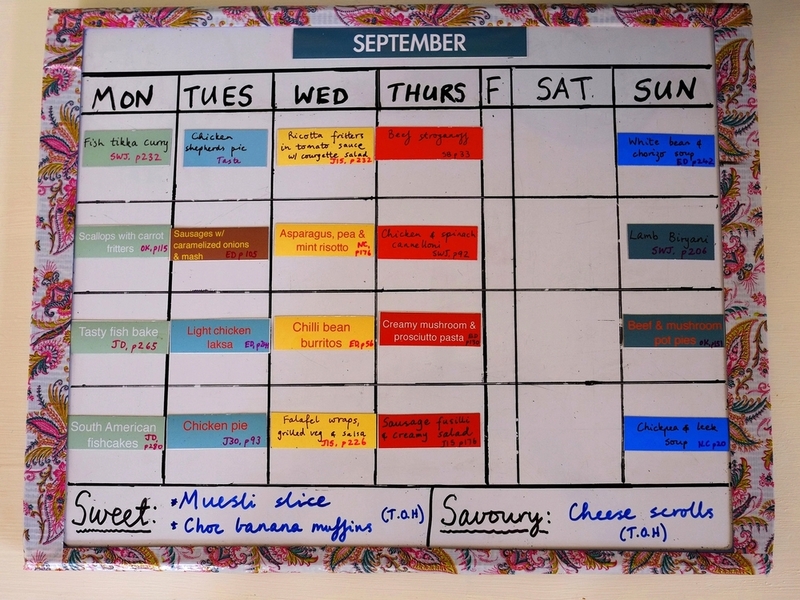 So, with everything prepared, here is a look at how I create a monthly meal plan. Side note: I do not do separate meal plans for my partner and I and the kids. The kids eat what we eat (apart from omitting some spices from their meals) and if they don't like it, tough luck! Might seem harsh, but no way am I cooking 2 lots of meals! I start by choosing a range of fish meals, which we always eat on Mondays. I tend to put pasta meals in next (always on a Thursday), as it determines what other meat dishes I put in e.g. if we are having beef stroganoff, I try not to put in another beef meal during that week. I tend to do the next 2 sections at the same time, which consist of either chicken, vegetarian or meat dishes, making sure I don't double up during the week on similar ingredients. For example, if we are having vegetarian burritos on one night, I don't plan for chicken wraps on another. Or if we are having a vegetarian risotto, I don't do another rice-based dish - I really try to have a variety, which can be tricky sometimes, and that is why I like to have my big collection of magnetized meal options to choose from. Next, I put in our Sunday meals, which tend to be either soup, lamb or beef - hubby likes to take over the kitchen on the weekends (yahoo!) and tends to make meat-based dishes. I usually leave Saturday blank, but sometimes put in our favourite meals such as tacos or nachos. It depends on how busy the day is. So, for me, the key to having a variety of delicious and easy dinner recipes, is to mix up the range of vegetables, sides, meats, and types of cuisine (Mexican, Indian, Italian etc). I would say this process of choosing meals takes me about 15 minutes now that I've got it down pat! Last but not least I choose a few things to bake for the week/fortnight, either on my own or with my 3 year old. I usually get the recipes from The Organised Housewife or Planning With Kids, as they are quick and easy, and great to bake with kids. 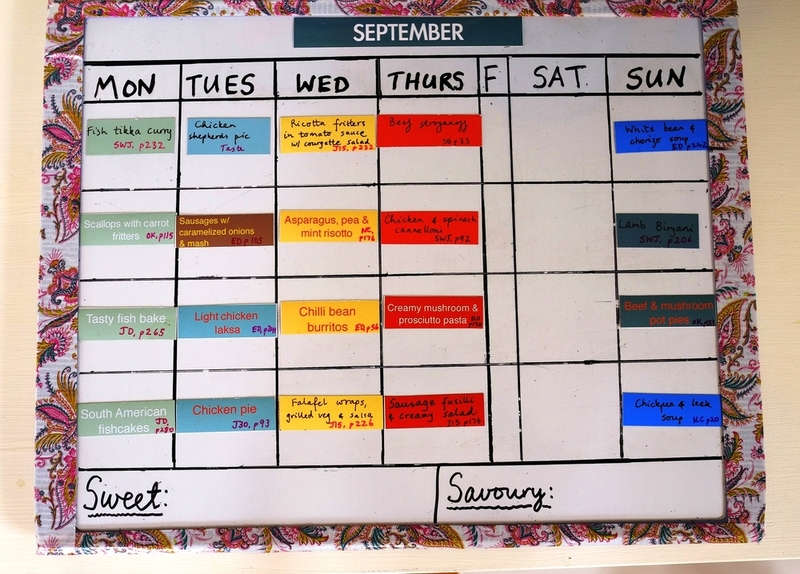 And that completes a month of meal planning! Done and dusted in about 20 minutes, and the best part is not having to think about meals again for a whole month. 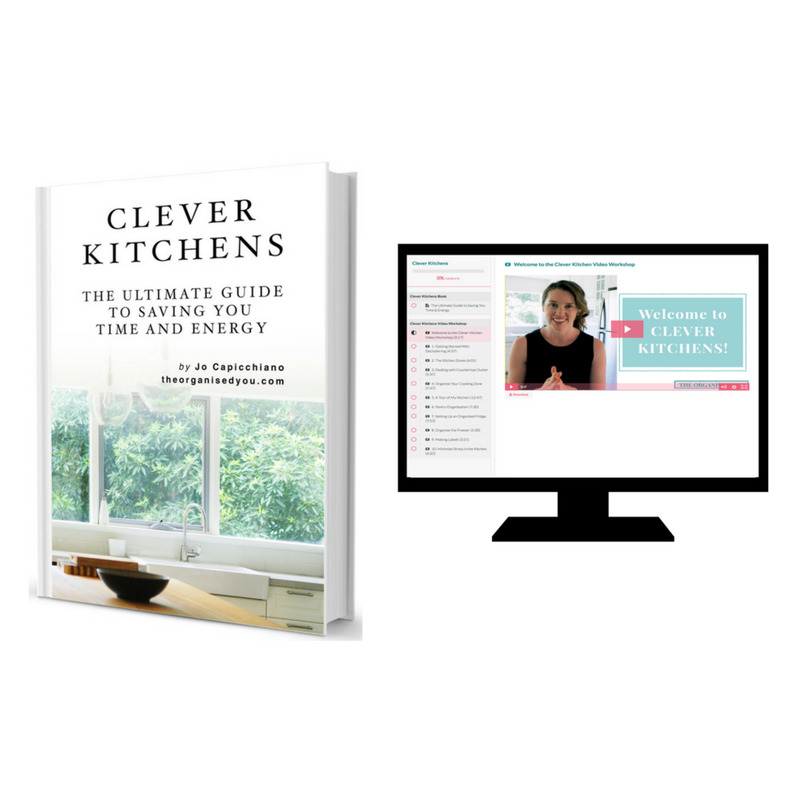 This process helps to keep me on track and save so much time, energy and effort on a daily basis. Win win!